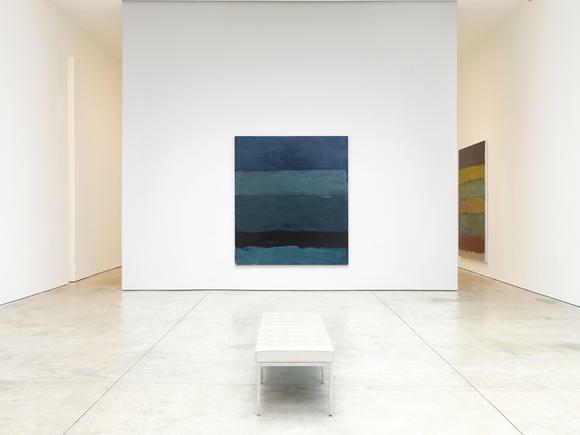 Cheim & Read is pleased to announce Landline, an exhibition of eight new paintings by the Irish-born American artist Sean Scully. Begun in 2013, Scully’s Landline series resonates with newfound urgency and freedom. Thick horizontal bands of subtly-layered color provide his compositions with rhythmic pulse, while the interactions between striations of paint bristle with energy. While Scully’s canvases recall, on their surface, the contours of the actual landscapes that inspired them, they deepen along levels of recent personal experience and trauma—both physical and emotional. Hatje Cantz’s publication of the book, Danto on Scully, will coincide with the Landline exhibition. In it, Danto’s essays on Scully’s work are assembled for the first time in one volume, with an introduction by Daniel Herwitz. The retrospective, Follow the Heart: The Art of Sean Scully 1964–2014, curated by Philip Dodd, was on view at the Himalayas Art Museum, Shanghai from November through January. The exhibition will travel to the CAFA Museum, Beijing from March 13–April 23. Sean Scully is the first western abstract artist to be the subject of a museum tour in China. Other major upcoming exhibitions for the artist will be: the Pinacoteca do Estado, São Paulo from April 11–July 11, the Palazzo Falier, Venice from May 9–November 22 and the National Gallery of Ireland, Dublin from May 12–September 20.